Nairobi Governor Mike Mbuvi has obliged to an order by the State to stop flying the national flag on his official vehicle. Reports indicate that Interior Principal Secretary Karanja Kibicho had phoned Sonko and communicated the order earlier this week. On Wednesday, it became apparent that Sonko had removed the flag when he posted on Facebook. “Mambo ya flag hizo nimekubali kutoa as adviced by Karanja Kibicho na Ndegwa,” wrote the County Boss. 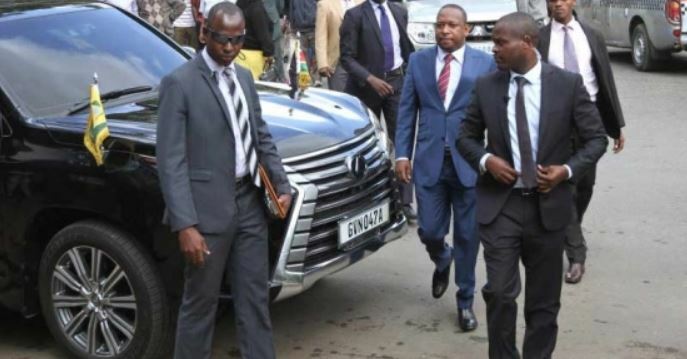 Sonko was the only governor in the 47 Counties who illegally flew the national flag on his official vehicle. According to the National Flags Emblems and Names Act, a person shall not fly the national flag on any motor vehicle, except with the written permission of the (Interior) minister. The only persons allowed to fly the national flags on their vehicles are the President and his Deputy, the Chief Justice, Cabinet Secretaries, speakers of the National Assembly and Senate, and Kenyan diplomats while in foreign missions. Governors are only allowed to fly their respective county flags. “A person who contravenes subsection (1) commits an offence and shall be liable, on conviction, to a fine not exceeding one million shillings or to imprisonment for a term not exceeding five years, or both,” warns the Act. In December last year Makueni Senator Mutula Kilonzo Junior published a Bill which proposed to amend the National Flag, Emblems and Names Act to allow members of the public to fly the National Flag in their places of residence, work, and business.